Wells Fargo Bank has agreed to pay $575 million to settle claims that the bank violated consumer protection laws. 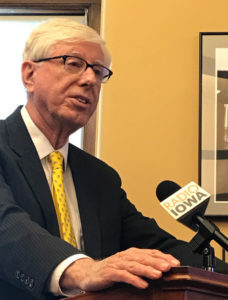 Iowa Attorney General Tom Miller says Iowa’s share of the settlement is $6.18 million. “That’s calculated mainly on the number of transactions and potential violations in Iowa, plus some additional money because Iowa was one of the five lead states in negotiating this agreement,” Miller said. Iowa’s share of the settlement will go to the state’s Consumer Education and Litigation Fund. He’s urging other companies to carefully review their policies to avoid similar problems. “How are you incentivizing your employees to act? Because it has real-world consequences, as demonstrated by today’s settlement,” Madigan said. Wells Fargo, also accused of illegal practices related to insurance and mortgages, previously reached a federalment and was slapped with a record $1 billion fine. Wells Fargo is the Des Moines area’s largest private employer, with about 14,000 workers.